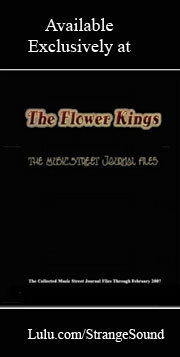 This Chicago band, formed in 1988, is a nice combination of Celtic rock, progressive rock, and deadhead music. The personnel on this 1995 album are Paul Bradley, Sean Cleland, David Callahan, and Mike Kirkpatrick with several backing musicians. 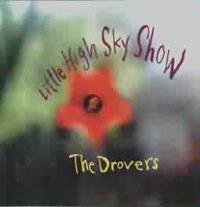 Little High Sky Show is available in stores and can be ordered directly from the band. To order from the band directly, go to their webpage at http://www.thedrovers.com to get an order form. An interesting folk tune, somewhat in the spirit of early Bob Dylan, Singlewing a quite pleasing way to start the album. The song also contains some textures that are somewhat in the modes of The Grateful Dead and Phish. Featuring a catchy Celtic/Folk sort of riff, this is one of the better tracks on the album. The style here sort of varies between the Celtic type of feel and an almost Klesmerish texture. This is a very entrancing melody, and features some nicely spacey vocals. Highlighted by a wonderfully psychedelic folk sort of sound, this track really seems very much like it could have been an early Pink Floyd offering. Sandy Candy is definitely one of the cooler songs on this album, and will certainly appeal to fans of early Floyd. This piece features a very interesting finale. Another song which is a bit reminiscent of Pink Floyd at times (but in this case some of the more minimalistic acoustic guitar and vocals songs from the middle era of the band), Toy includes an arrangement which becomes rather complex at times. That complexity draws primarily from some very nice keyboard and violin texturing. Another folk sort of song with Celtic leanings, this track is nicely done. If You Cry, Elizabeta also contains a fairly catchy instrumental hook and some `60`sish textures. This track also shows some early Pink Floyd sort of leanings, and features some very hypnotic layering. This is a very nicely arranged piece. The extended instrumental conclusion to this track features some fine percussion work and is rather in the vein of the acoustic side of Led Zeppelin at times, but also features some fine psychedelic/alternative guitar wailing perched over the top of the rest of the instruments. Clearly set in a pleasing acoustic alternative mode(although it does contain a large dosage of clean electric guitar work), this track moves rather gradually, but actually progresses quite well, and embodies a very interesting mood. Beginning with feedback guitar, almost in a Jimi Hendrix mode, The Bag is a 22 and 1/2-minute tour de force which covers 4 tracks on the album. The feedback work eventually gives way to some pretty guitar stylings, which are as time goes on, joined by some remarkably evocative violin music. When the intro ends, at about 2 1/2 minutes in, the song takes on a delightfully psychedelic sort of feel, again a bit reminiscent of Pink Floyd. Then, the instrumental break introduces some genuine Celtic violin work, while still maintaining the previous feel of the song. The violin continues riffing throughout much of the later vocal work, and the percussion here is quite interesting. This song very nearly got the album included in the progressive rock section of the newsletter, because with all of it`s interesting vocal work, extended format and quirky changes it certainly qualifies as progressive rock. In fact this composition, the highlight of the album, is a progressive rock piece on an even par with much of the progressive rock of the 1970`s, and earns this album a high recommendation for any fans of progressive rock. This song encompasses psychedelia, Celtic, progressive and many other musical styles all in one particularly coherent piece, including a final section which is very Celtic in musical style, but still featuring the rather spacey, psychedelic styled vocals, and a wonderfully powerful jam which serves as the conclusion to the piece. This album contains a hidden track located after several tracks of silence. This hidden song begins with an instrumental droning, and then slowly morphs into a well-layered instrumental piece featuring some interesting Celtic based stylings, before evolving back down to a drone for the conclusion of the song and the album.